The rapid advancement of technology is leading to the increase in passive activities that require little thought or imagination. People are scrolling through their phones and playing video games instead of reaching for a book before bed. Due to this imagination crisis, most book stores have scaled down or are closing. Our team was challenged to reinvent Barnes & Noble, the only national chain book store left in the United States. Enter the new Barnes & Noble: Where stories live. Large interactive Nooks at the front entrance would serve as a display for the Barnes & Noble Nook as well as a guide through the new space. The main floor would include modular seating, a reimagined cafe, retail, and a multiuse performance area. The imagination floor would encourage visitors to hang out and work or play in communal spaces with modular seating. StoryCorps’ mission is to preserve and share humanity’s stories in order to build connections between people and create a more just and compassionate world. These booths, found on the imagination floor, would play individual's community stories. LED Interactive boards on the imagination floor would encourage participation from visitors. Whether drawing, reading stories submitted through social media or playing with magnetic poetry. Toilet paper in restrooms would include alternating stories. Follow the stories along the sidewalk as you approach the concept store. Planted little free library bookmarks would lead one person to visit a new story. New merchandise would include rebranded Barnes & Noble merchandise as well as mystery wrapped books. Employee uniforms would include the individual's personal stories. Would you like to sign on to the wifi? Fill out a Mad Libs and read a funny story first. Visit the rooftop bar at the concept store and read a menu that doubles as a bookmark inspired by stories. Your menu doubles as a bookmark. The coasters at the rooftop bar include story starters for visitors. Direct message you short stories to our Twitter feed and we will publish them weekly. A redesign of the Barnes & Noble app allows you to pair your Nook device and have a more personalized suggestions. Create a backstory for sponsored images. 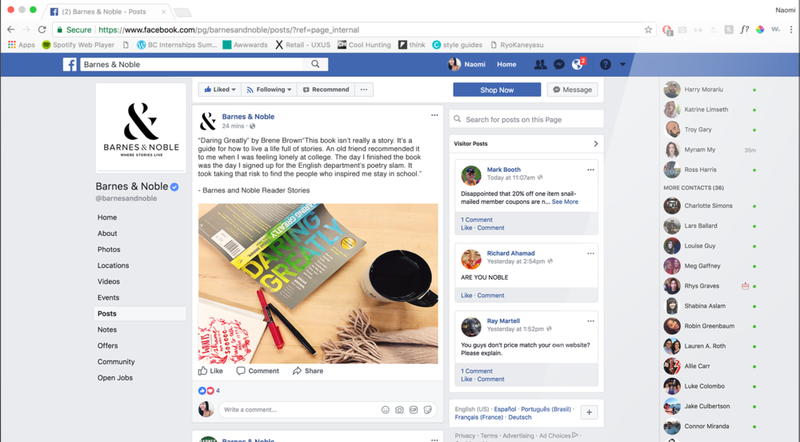 Barnes & Noble sponsored posts would include stories shared by readers about how they found books and/or stories. A new membership structure would include a tiered system and keep in line with the idea of "where stories live" by including warrior, hero, and legend membership levels.